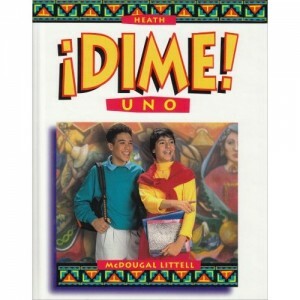 The second edition of the Spanish textbook, ¡Dime! Uno (McDougal Littell, shown below), was published in 1997. Is this your Spanish text? In this video post, Joshua Thoms speaks directly to language educators, asking: How do we equip our next generation of language teachers with updated and effective textbook resources? Can OER be the answer? Do student teachers trained at your institution have the necessary materials and tools when carrying out their foreign language (FL) student teaching experience(s)? Is this something that should concern us in higher ed? Should there be a more targeted effort by members of the FL technology community to provide OER resources (i.e., FL materials, textbooks, tools) to teachers at the secondary level? If so, how can this be done? Is it being done? Joshua J. Thoms is an Assistant Professor of Spanish and Applied Linguistics at Utah State University. His research interests include the role of classroom discourse in L2 learning and teaching, computer-mediated language learning, and issues related to foreign language textbooks/materials. 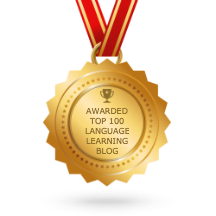 To read more about teaching a FL with OER, see Why I Love and Hate My Spanish MOOC by Fernando Rubio. One of my pre-service teachers is doing her internship without a textbook. Similar to the instances you mentioned, the cooperating teacher instead works with a coursepack that she has put together (if I recall correctly, there are textbooks in the room, but they aren’t used, and I don’t know if they are up to date). My student did not mind working from the coursepack, but she also was very happy to be with her cooperating teacher in general. Her CT had many years of experience and good rapport with the students, so my student felt like she was learning a lot. This blog entry made me wonder if that coursepack was at one time born out of necessity and realize that my student’s positive experience with the coursepack may be the result of many years of the CT searching for/creating her own materials. I’m curious as to how widespread coursepack use is and how both in-service and pre-service teachers view it. Thank you for your comment, AMikulski. I, too, am curious to find out more about coursepack vs. textbook use among student teachers and their CTs along with understanding their reasons for using one or the other. When I discovered that the first student teacher and his CT were not using a textbook, I thought that perhaps it was an isolated incident due to local ‘variables’ here in Utah (http://www.sltrib.com/sltrib/news/54350036-78/utah-education-per-state.html.csp). However, I think the problem is more widespread. It would be interesting to hear from others about what it is like in other parts of the country. Never let a crisis go to waste! What a timely topic, Joshua. Creating, mixing and repurposing materials is so much easier now that we should use this opportunity to start moving away from the static print textbook and focus more on giving our future teachers the skills necessary to create and deliver easily updatable and engaging open resources. Does the open education movement have a presence in secondary ed? Maybe in other disciplines? If anyone has any information, please share it. Thanks for your comment, Frubio. I agree that eventually digital texts should (and will) replace static, print-based textbooks thereby giving new meaning to how we define ‘custom’ editions. Recent acquisitions of software companies by a number of publishers (http://chronicle.com/article/Dont-Call-Them-Textbooks/136835/), suggests that content in textbooks will certainly become easier to create, update, and share. Hopefully these new digital texts don’t come with very large price tags. I guess that would just be more fuel for working to grow the OER movement. In any case, I’m hopeful more materials and tools will be specifically created and used for/by teachers in secondary ed. Thanks for the post Joshua! Lack of access to quality textbooks is a huge issue for K-12, and models of OER solutions are out there. For instance, the CK-12 Foundation provides open textbooks for K-12 in STEM subjects. See http://www.ck12.org/teacher/ . They offer what they call “FlexBooks”, — openly licensed digital textbooks that are fully customizable. You can freely print or download the books in a variety of digital formats, or create your own version of the book using their online editing platform. Hi Rachel. Thank you for sharing that resource; hopefully FL materials/textbooks will be offered on that website in the near future. In thinking about my topic a bit more, I get the sense that OERs are not something that teacher training/preparation programs (i.e., for undergraduate students wanting to teach at the secondary level or for graduate student teaching assistants wanting to teach at the college level) typically include for their students. My hope is that more programs would emphasize not only how to effectively integrate technology into L2 teaching, but would also make students aware of what OERs are and where one can find them. Personally, I’ve directed students to CLEAR and COERLL so that they, at the very least, know that these kinds of FL resources exist. Great post, Joshua. The scenario that you described–public school teachers without teaching materials–is something that we have heard about a lot from teachers. And I agree that this calls out for an OER solution. Français interactif has been in heavy use by high school teachers for many years now. And it is all advertised by word of mouth: teachers talking to teachers. Hi Carl. Please keep us posted regarding an introductory Spanish OER. I think many teachers (especially those just starting out in the profession) in schools/districts where resources are scarce would greatly benefit from this proposed text. Here at Duquesne we have a program called College in High School and there are 4 high schools in our surroundings that offer Spanish Advanced classes (similar to AP classes). If students pass this class successfully they can transfer the credits to Duquesne University. Lasty month I visited 3 of the high schools to meet the teachers and see the general idea of this program (I just got here). No textbook was in place either. I thought maybe because it was an advanced class the teacher wanted to customize the material… but whatever it was… those teachers had to create their own material which is a big time investment. Hola Lucita. I appreciate you sharing your experience in your area/institution. Effective teaching always requires a huge time investment. However, not having a basic tool (i.e., the textbook) at one’s disposal results in that much more work/time/energy needed (especially for new(er) teachers). Hopefully more OER-based materials will be created to address this growing problem. Thanks again for your comment! Many of our future teachers find this same situation with their student teaching. I can go you one worse, however – my daughter was subjected to DESTINOS videos just last year in high school Spanish, those original 1992 videos. Appalling! Our department is considering moving away from textbooks all together, looking to develop curriculum that crosses languages, as well as resources that are available online and free, and are language specific. We currently use a digital textbook that we like, but that is extremely expensive for our students. When you consider the fact that paper, printing and shipping is not involved, the savings is not being passed along to our students. Looking forward to more here at the COERLL blog! I am hearing the same story from FL teachers everywhere. The cost of printed textbooks has reached a tipping point. And it seems silly in light of all the good resources that are now freely available. So, COERLL needs to get the word out about OER and educate teachers about what already exists. That said, we still have a ways to go before the quality of OER can compete with commercially produced materials. That that is coming…stay tuned. And thanks for participating in this discussion. Please tell your colleagues to join the discussion so more people know about these developments in our field. Thanks for sharing what is happening in your dept./at your institution, Claire. I would be interested to know which digital textbook you are currently using and how much it costs.